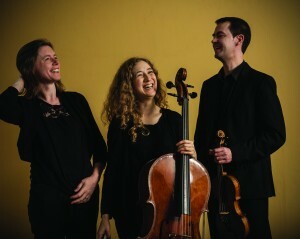 On Thursday, February 26th 2015, the Music Department at St.
the internationally acclaimed Fidelio Trio, taking place at 10am and 11am. and discussion of the Trio’s repertoire, with a Q&A session included. The event will be free of charge for all attendees. Music, Shanghai Oriental Arts Centre, Princeton University. musicians of the highest standard, please RSVP as soon as is convenient to musicresidency.events@spd.dcu.ie with the number of attendees and preferred time slot.